With ten new property tax proposals under consideration in Honolulu, which I highlighted in my post “Tax watch: Honolulu property taxes” (7/16/13), it’s a good time to think about what makes for fair and reasonable property taxes. It still bothers me that we are forced to pay taxes on property that we already paid taxes on. I have to be realistic and accept that our property taxes pay for city and county programs – even though we pay for many government services through user fees. In Honolulu, real property taxes are expected to generate $834.8 million in fiscal year 2014, almost 40% of the total operating budget. Three years ago, in a post titled “Sensible property taxes” (8/3/10), I suggested a flat property tax fee based on lot type, lot size, and building square footage. This idea may be too simple and generate too little revenue for lawmakers to accept. But I think that the existing property tax classes and all of the exemptions are too complicated and I wanted to generate some ideas to simplify our property taxes. 1. Fair and reasonable property taxes. Limit property taxes to a 2% annual increase (or decrease), with two rates for structures and land. We shouldn’t have to pay soaring property taxes because the “real estate market” is booming; and the city shouldn’t suffer if there is a dramatic drop in home valuations. 2. Easy to understand property taxes. Instead of 8-10 property classes, let’s set 5 property tax classes based on the fundamental land use. 3. Easy to comply with property taxes. I suggest keeping a minimum property tax rate for all properties, and reducing the number of exemptions to just two: 1) an exemption for owner-occupied principal residences; and 2) an additional exemption for low-income residents who are age 75 and older, blind, deaf, disabled, or deployed military personnel. With a simplified property tax plan, could we generate enough revenue to pay for city and county services? Would a commitment to fewer exemptions and less paperwork help the tax department save time and frustration? Please think about property taxes and how they may affect you and your neighbors, wherever you live. If you feel strongly about an issue, speak out! Talk to your family and friends, let your Honolulu Councilmember know about it, and write letters to the local newspapers. Did you know that researchers are working on network-connected pill bottles that track whether you’ve taken your medication? Bike helmets that let you know if the cyclist has been in an accident? House slippers that take readings and alert personnel if there is a medical problem? I read about these developing products a while back in an article titled “What Will They Think of Next” by Matt Hendrickson. I thought about these healthful inventions when I recently read about car accidents and injured hikers. In fact, almost every day, there is a report of a traffic accident, an ocean accident, a hiker in need of rescue, or a missing fisherman. The law can’t keep us safe from every danger, and it can’t protect us from our own bad decisions. But maybe there are inventions that could reduce our risk and make us a little safer in dangerous situations. Here are some outdoor safety innovations that could make us safer on land, in the ocean, and on the road. I don’t know whether these ideas are being worked on today, but I think they can help us choose to live more safely. * GPS safety bracelet. Hotels, national parks, state beaches, outdoor sports companies, and nonprofit companies could rent a GPS safety bracelet, which could be activated when a hiker, swimmer, surfer, or paddler is lost or in distress. The GPS feature would give them peace of mind and help rescuers find them quickly and easily. They bracelet wouldn’t prevent accidents, but it could reduce the cost of rescues, by minimizing search times and getting help to travelers sooner. * Sun safety bracelets. Hotels and outdoor sports companies could offer bracelets that measure body temperature and UV rays, and alert the wearer when they are too hot from the sun or need to re-apply sunblock. There are already color-changing sun-sensor stickers that remind kids to re-apply sunblock, and plastic UV-sensor cards that warn you of impending sunburn; a sun safety bracelet shouldn’t be a stretch. * GPS walking sticks. National parks, hotels, and outdoor sport companies could rent walking sticks to hikers, which could help hikers keep their footing or aid hikers if they are injured. The walking sticks could come with a GPS feature in case the hiker gets lost, and it could also send out a signal if the hiker has an accident and the walking stick is broken. * Pickup truck safety belt attachments. Personally, I think that adults can decide whether they want to wear seat belts or ride in the back of pickup trucks, as long as it doesn’t harm anyone else. But to make riding in pickup truck beds safer, car dealerships and car rental companies could sell or rent safety seats or safety belt attachments for pickup trucks. We strap in refrigerators, construction materials, and mattresses; how hard could it be to add a padded chair back with straps? * Youth seatbelt adjusters. Hawaii law requires that children under age 4 use a child safety seat, and rightly so. Infants and toddlers need additional support and restraint. But Hawaii law also requires that children under age 9 use a booster seat, which I think only benefits booster seat manufacturers. Most children over age 4 should be able to sit in the car and use a seatbelt adapted for their size and height. Car companies could install adjustable seat belts or auto parts manufacturers could offer seat belt attachments that would allow people of all heights to wear them safety and comfortably. Some school buses in Hawaii already have SafeGuard adjustable seat belts; why not passenger vehicles? What products and inventions do you wish you could use when you’re outdoors? How do you keep safe when you’re traveling, vacationing, or just relaxing on the beach? What could you do to make Hawaii a safer place? July is Park and Recreation Month, a time to celebrate the importance of parks and recreation to our health and wellness, conservation and social equity. Park and recreation employees protect our open spaces and natural resources, and provide us with fun, outdoor activities for our health. I’d like to thank all the dedicated personnel and maintenance workers who do the best they can to keep our parks clean and safe. In Hawaii, our parks and recreation opportunities are amazing. In addition to beautiful beaches, mountain trails, camping, fishing, hunting, and water sports, our kids can picnic in grassy parks and play at neighborhood playgrounds. We have public pools, gyms, tennis and basketball courts, baseball and soccer fields, skate parks, enrichment classes, and children’s programs. As a college student I spent two summers working as a recreation aide at a local park (it taught me a lot about patience and keeping your cool). When my son was a toddler, we often took him to local playgrounds to get exercise and practice climbing, sliding, swinging, and balancing. Now that he’s older, we’ve signed him up for after-school classes, we take him to baseball practice and Pinto games, and enrolled him in the summer fun program. When we have access to public parks, we tend to exercise more, have a greater sense of well-being, and feel more connected to the community. Parks and open spaces can reduce air pollution and water runoff, increase property values, revitalize neighborhoods, and even reduce crime, according to “The Benefits of Parks: Why America Needs More city Parks and Open Space” (2006), a report by the Trust for Public Land. In Hawaii, there are 7 national parks, with over five million visitors in 2012. Even if you can’t visit one of our national parks, Haleakalā National Park and Hawai‘i Volcanoes National Park have great online resources for kids to become junior rangers, download activities, and learn about Hawaii and nature. There are also 53 Hawaii state parks, historic sites, and monuments; and numerous regional and neighborhood parks. When you visit our parks and hiking trails, be a good visitor and caretaker of the land. Please pick up your litter, pack out what you pack in, and don’t damage the plants, animals, historic sites, and reefs. And thank the parks and recreation volunteers and staff you meet. How often do you go to a neighborhood, state, or national park? What are your favorite parks in Hawaii, and what makes them special to you? Share why you love your park and recreation and your photos at http://www.nrpa.org/july. When I was in school, the emphasis was on getting into a good college. When I was in college, the emphasis was on getting a good job. I really admire people who don’t wait around for something good to happen to them; they make good things happen for themselves. 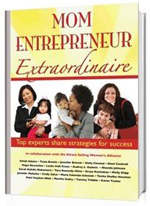 That’s the message in every page of “Mom Entrepreneur Extraordinaire: Top Experts Share Strategies for Success” (2011) compiled by the Direct Selling Women’s Alliance. It’s a collection of 21 practical essays and personal stories, written by successful mom entrepreneurs to help other moms juggle family and career. These women didn’t try to make their family fit around their career; they built their career so that they could support and devote time to their families. Three mom entrepreneurs from Hawaii are represented: Grace Keohohou, co-founder of the Direct Selling Women’s Alliance; and Sarah Kalicki-Nakamura and Cindy Sakai, co-founders of TH!NK LLC. Keohohou offers advice for getting your family involved in your business, creating a family calendar, and setting priorities. Kalicki-Nakamura shares her mom-to-be story and reminds us to make our family our priority. Sakai offers practical tips about traveling for business with our family; and suggests that when we travel and the family stays at home, plan little surprises for them each day you are away. “You can have it all, just not all at once” (page 27), Kalicki-Nakamura declares. Start with a compelling vision, something you are passionate about. Add a motivating mission statement. Set SMART goals that are Specific, Measurable, Attainable, Realistic, and Timely. Use the SWOT technique (inner Strengths and Weakneses, outer Opportunities and Threats) to analyze your business. Create detailed strategies and ways in which to implement those strategies, including “now” action steps. Solve problems with the PMI system: Pluses, Minuses, and Implications. Take care of yourself. Get enough sleep, pay yourself first, ask for help, reserve quiet time every day, and strive for flexibility before balance. Create a support team to pull you through tough times. Surround yourself with people who elevate and raise you up. Find the right mentor. Commit to purposeful profit. Know the purpose of your company, how you will invest the profits, and what your priorities are. Maintain grand visions for success with LEGACY: Live like you’re dying, Eliminate fear, Generate your own momentum, Action, Chart and chase one dream at a time, and You define success. Handle documents once! Don’t leave things in your Inbox. Do it, delete it, diary it, discard it, delegate it, or file it. Keep a gratitude journal. Write down the things you are grateful for every day. Every week, chose something on the list and thank the person who made it possible. Keep a brilliance journal. Write down the times and events when you feel happy, successful, and proud. Next to each event, write at least one thing about you or that you contributed to make it possible. Create a vision board. Cut out pictures of the things you want to do and have, and the places you want to visit. Use it to motivate and inspire yourself. Even if you have no interest in starting your own business, remember these two principles: First, make your family a part of your dreams and goals. And second, when you are with your family, give them your full attention; when you are investing time in your business, give it your full attention. For more information about women entrepreneurs, visit the Direct Selling Women’s Alliance. And if you have advice or tips for mom entrepreneurs, please share them with us! As the United States celebrates Independence Day, it’s a good time to reflect on the meaning of independence and freedom. One of the best and most concise explanations for a free society that I’ve read comes from the Ayn Rand Center for Individual Rights. Limited government. For individuals to benefit from living together, we need a government that performs three basic functions: the police, to protect individuals from domestic criminals; the military, to protect individuals from foreign threats; and the court system, to enable individuals to settle disputes without resorting to force. Because government has a monopoly on the legal use of force, government’s every action must be objectively controlled and explicitly authorized. Objective laws. There are two requirements for objective laws: 1) Laws must allow each individual to know, before taking any action, what conduct is illegal, why it is forbidden, and the penalty for violation; and 2) Laws must only forbid private conduct that violates the individual rights of others. Individual rights. Rights are moral principles that define our freedom of action within society. A society is free when it secures our moral rights to life, liberty, property, and the pursuit of happiness. Our rights give us the freedom to support our lives and earn property by our own efforts, not by the efforts of others. “Freedom, in a political context, means freedom from government coercion,” Rand wrote. How do you measure freedom? What freedoms are you thankful for? How much freedom would you be willing to sacrifice for your own safety and protection? You are currently browsing the Better Hawaii weblog archives for July 2013.